The Son of Odin and the wielder of the Mjolnir is not easy to depict, yet Chris Hemsworth has done it like he has been Thor all along and people just had to wait till the release of the movie to discover the Godliness in Him. Standing tall at 6 feet 3 inches and a 1/4th weighing 91kgs and named among the sexiest men alive, it was only a matter of time that fans began to get curious about what he eats and how he works out for the frame he has been portrayed in. The good news is, the future King of Asgard has allowed a sneak peek into his diet and fitness schedule which is worth a shot for good. The godly physique of Thor is not exactly rippled with many pack abs as is prominent in many other actors and sports stars. He is tall and well built with a reasonable 10% to 12% body fat level which grants the radiance to his features. Basically, Chris Hemsworth engages in a 90 minute workout schedule per day for 5 days a week, every minute of which is used to perfection and dedicated to every part of his body, starting from his arms and shoulders, to abs and glutes to the legs. For his upper body including shoulder and arms, Chris Hemsworth focused upon exercises like flat bench press, incline dumbbell press, cable crossover, t bar row, 1 arm dumbbell row, bicep curls, tricep extensions, weighted pull up, weighted dips, cable crunch, oblique crunches etc. For his lower body, exercises like squats, lunges, leg extensions, standing calf raise, rack pulls, dumbbell swings, leg curl machine, dead lifts, hamstring curls etc are included. While this routine sounds tiring and trying at the same time, the fact that the actor rests completely on the two off-days is a lesson that all enthusiasts must learn. 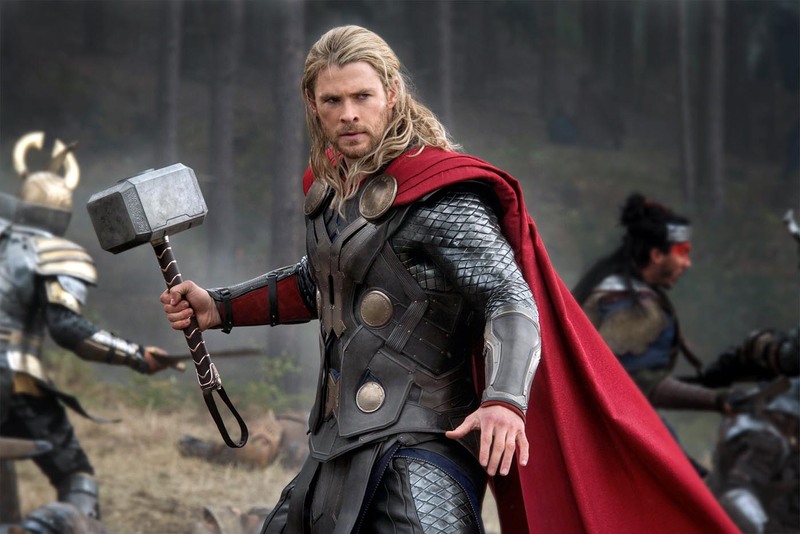 Did you know that for the role of Thor, Chris Hemsworth had to put on 20 extra pounds? However, after gaining the mass, he had to convert it into pure muscles while scraping off the ‘fat’ in it. So, the diet of Thor had to be more muscle centered which brought in the requirement of pure proteins in its leanest and freshest form. Egg whites, chicken, fish and stake were all thus included in the diet. Fresh fruits and vegetables with proper balanced carbohydrates and fats were also included. As far as carbohydrates are concerned, Chris Hemsworth did not engage as much in starchy options like white rice, potatoes etc, but focused upon fibrous options like broccoli, spinach and other green sources. The exercises and workout schedules to attain the shape of Thor can be extremely trying, so it is imperative that you proceed with caution and that too under professional supervision. Overdoing it from the very first day may do more harm than good. The idea is to start slowly and steadily engaging at the most 3 days a week for not more than an hour and increasing accordingly.